Thank you for joining me as we count down to the MFT release. We are three days away from the big day! All the new Stamps and Die-namics will be available on Tuesday, February 6 at 9:00 pm EDT. Be sure to check out the MFT Blog to see all the new items being revealed today. Don't forget to leave a comment on the MFT Blog countdown posts, YOU could win one of the five $75.00 gift vouchers. I have another Valentine's Day card to share with you today. I paired the gorgeous new Musical Notes Background with an Alcohol Ink background. I love the look of the background on the alcohol ink filled Yupo paper. The sentiment is from the Jungle Vibes stamp set, and it fits perfectly with this background. Lovely card!The background is simply stunning!Thank you for sharing! The white elements are fab against the alcohol background. Thanks for the inspiration. 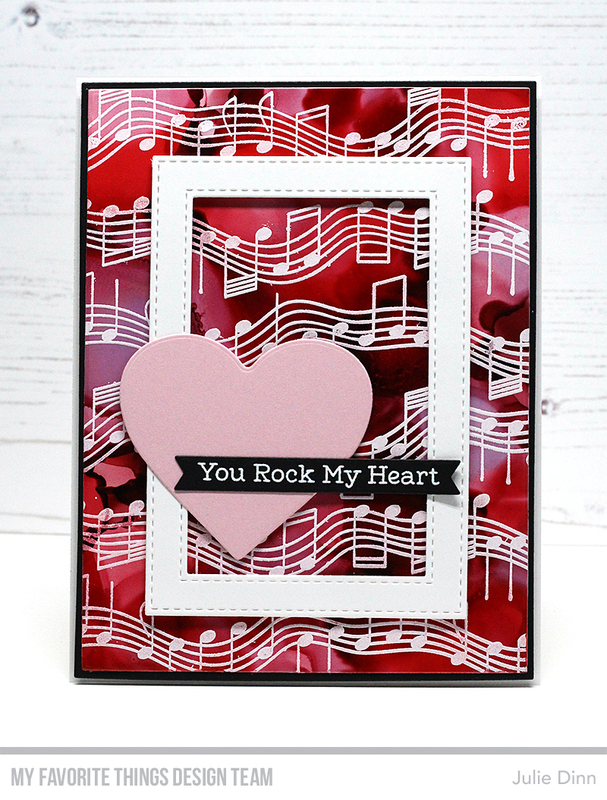 Terrific card for valentines with gorgeous red music! Lovely card, love the background colors!